- Image enhancement plus batch capture software application. With scanning speeds of 100 ppm/200 ipm (200/300 dpi), the fi-7600 greatly improves process efficiency. Large volumes of information can be captured from various media, including thin paper, plastic cards, envelopes and long page documents. Skew Reducer automatically handles sheets of paper in a stack individually, so that if one sheet is fed-in skewed, subsequent sheets are not forced into physical skew. This ensures that all information in the documents is captured correctly, even in batches with mixed document formats. 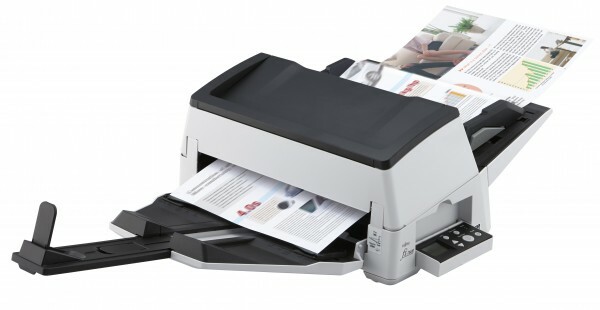 The Paper Protection function monitors document movement and automatically stops feeding when any irregularities are detected. The fi-7600 is equipped with an operation panel on both sides allowing for right and left handed use. The LCD on the operation panel reveals the scanner status at a glance and enables instant operation. The Automatic Document Feederâ€™s (ADF) independent side guides move to exactly the position required for each batch. The adjustable stacker side guides support neat alignment of processed documents. The fi-7600 comes bundled with PaperStream IP, an integrated scanner driver and image enhancement module that is built on TWAIN/ISIS standards offering user friendly operability, intuitive high quality image creation and real time processing that will benefit post scan routines like OCR. PaperStream Capture enhances the document capture process from adjusting scanning settings to performing batch scanning, verifying data and releasing to directories, repositories or subsequent process routines. Users can complete data capture tasks easily with the extremely user-friendly graphical user interface (GUI). Moving scanned batches into a queue for later retrieval is possible as well. A one year Advance Exchange is offered as a standard warranty and this includes online support along with parts/labour and shipping costs. Advance Exchange involves the delivery of a refurbished scanner which replaces the faulty scanner. Service upgrades are available that extends the warranty period to 3 years and additionally offers the possibility for items like onsite service with impressive response and repair times, accidental damage cover and remote desktop support.